12 members of the ‘hidden’ Armenian community from Dersim, Turkey, are baptized into the Armenian Church. ISTANBUL (Agos)—Following a six-month course of church doctrine and basic knowledge of Christian belief, 12 more Dersim Armenians took their first step back to Christianity with a collective baptism ceremony. Two married couples also held religious engagement ceremonies following the baptism ceremony held on May 9 at the Yeşilköy Surp Stepanos Church in Istanbul. 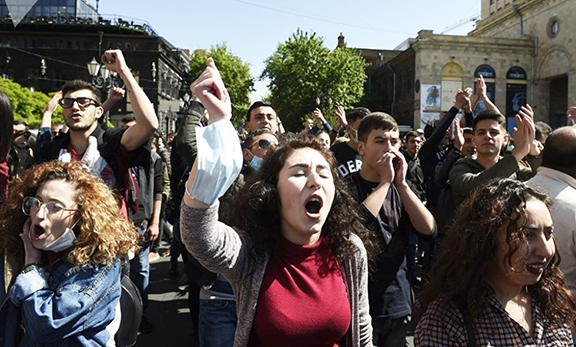 The efforts of forcibly Islamised Armenians to “return to their identity” have accelerated in recent years. Such individuals display a desire to live and express their identity openly, which they are forced to conceal in their neighborhoods, at school and at their workplaces, and to bring an end to the division of identities sometimes even experienced within the same family. Dersim Armenians have thus organized collective baptism ceremonies at Armenian churches to officially return to their religion and identity. Led by Father Dirtad Uzunean, the baptism ceremony was presided over by Archbishop Aram Ateshian. Nazar Binatli, Pakrat Estukian, Boghos Cholak, Kamer Karatayli, and Hagop Altınkaya were the godfathers of the Dersimians who returned to Christianity and took the names Karin, Derev, Naira, Lia, Arev, Arshaluys, Kristin, Hovnan, Rupen, Hovannes Minas, Lusin Mane, and Minas. The couples Boghos and Sirpuhi Cholak and Hovannes and Lusin Cholak consolidated their marriage ties by repeating their vows in the presence of the Church. Yervant Dink and Kamer Karatayli acted as groomsmen for the couple. Agos spoke to some of the Dersim Armenians who were baptized on Saturday at the Surp Stepanos Church, and asked them about their feelings. “We are returning to our roots,” Arev said. Bravo, Why a six month ordeal.? It should be fast-tracked into two weekends. We Armenians make it so easy for our members to wonder away from the flock, but when it comes to stray sheep coming home, we make them bleat by the front gate, hoping that they would go away. Ammot mezi. IT STARTS ! There is HOPE ! God bless our brothers and sisters in Western Armenia. “I will wear my cross around my neck”. Brave Armenian Christian lady. May God bless those Armenians who were forcefully ‘Turkihied and Islamized in the land of “fake” Turkey. Let’s keep our eyes open on how these are treated henceforth.